Length: 33cm (13 inches). Height 27 cm (10.5 inches). Her true love turned into a dragon. The pair are surrounded by crystal formations and roses. 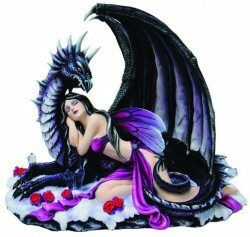 An eye-catching Gothic Fairy and dragon Figurine with great detail and design. Made from solid resin for a stone statue look and feel. Heavy display piece.